KANSAS CITY, Mo. - A Tommy Gun and shotgun reportedly owned by the Depression Era bank robbers Bonnie & Clyde were sold at auction today for a total of $210,000. The .45 caliber Thompson Sub-Machine Gun was believed to have been used by Clyde Barrow and Bonnie Parker. The seller's great-grandfather, who was in law enforcement, was given the gun after the weapon was seized in a raid in Joplin, Mo., in April 1933. Though no arrests resulted from the raid, a cache of weapons and a camera - containing photos of the outlaws - was confiscated. 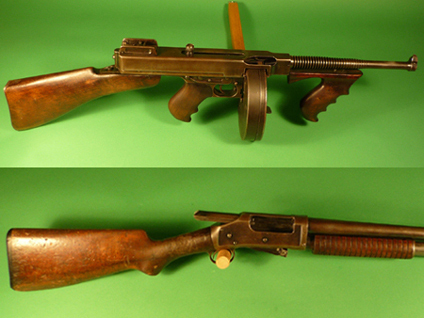 The Tommy Gun sold for $130,000. Also sold today was a Winchester 12-gauge shotgun, acquired in the same raid, for $80,000. The auction was held by Mayo Auction & Realty.